Fast shipping, correct part, excellent service ! Thank you ! Will buy from you again ! Thanks, looking forward to serving you in the future. We're happy your experience was a positive one, thank you for your busines. Happy to help, thank you for your business. The parts were exactly what I needed and my problem was resolved. This is a one stop shop. Everything you need at one location. Once my order was processed it arrived quickly. The item description was perfect and made it easy to make sure I ordered the right part. Glad your experience was a positive one, thank you for your comments. Thank you for your business, glad you were happy with the result. Staff very, very helpful over the phone and online. Really appreciated it. Super fast shipping which was great. Parts just what I asked for. Quick and simple to order and fast delivery. I'll buy from again. Thank you. Very good service mailed right away, didn't overcharge for shipping as a lot of companies tried to. They shipped from Florida and arrived in California within 5 days. I would definitely buy from them again. Super fast shipping. Great price on hard to find part. Thank You! We've purchased these previously through AMAZON, but their suppliers never have enough stock, they are higher priced and takes4-5 days to ship. 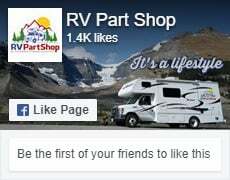 I would only suggest that the RV Part Shop would ship same day, if ordered before 12 pm. First time to order from you. Outside of the mix up on my order; my experience with has been very favorable. Easy to order. Thank you very much for the quick delivery of our items excellent service. Prompt shipping. Product as advertised. I initially ordered the wrong arm for my awning. They called me before just shipping what I ordered. RVParts got me the right part that I needed. The initial sale a delivery of the product was good. However, as the first point of contact for information on the defective products, they were slow to respond to any messages or reach.